Machine washable making them easy to clean and re-fit. Fits securly around the car seat with fastening straps. Twin pack of protectors to protect both the driver and passanger seat. Great product which is well made and not very expensive. I didn’t want a ‘junk holder’ hanging off the back of my seats but this protects from my son’s muddy boots. For the sake of £10 it has saved my leather which is still immaculate underneath. Easy to fit great product. I had the previous version of this product on another car .The change on bottom by adding the hooks , was a very wise decision .Good product . Unfortunately the seat protector does not fit my Ford Mondeo. The lower straps are not long enough to go around the seats. I cannot see how they would fit any car seat of a medium sized car. OK but a bit too short. My grandson is 4 and his feet are below the cover, hence still marks on the back of the seat, but just a strip at the bottom. Been much better if they had been longer. I have them in a Volvo V40 R design,. Really pleased with these. Easy to install, good size and handy pockets. Great product for smaller cars, but loses a couple of stars because it doesn’t fit the very large sports seats in my X5. The strap at the bottom is about 6inches too short to fit all the way round the base of the front seat. I had to sew an additional length of strap and then just tie a knot rather than use the clips. Kick mats are ok apart from the straps that fit around the head rest, the straps are far too short if your head rests are integrated within the seat I had to purchase extra webbing and buckles to lengthen the straps. They are easy to install and convenient. A good fit and they do the job.Our car has sport seats so the securing elastic at the bottom of the protector has to be pushed into the crease between base and backrest. Fit seat perfectly, didn’t use the strap that goes round the middle seat and they are lovely and snug on our leather seats. Great value as two in a pack, saves all the mud and scuffs. Recommended. Very good product and nice quality. Recommend it to everybody. Thank you. These perform very well and keep little feet off the seat backs. Easy to fit. I got this as a free gift for my honest and unbiased review . This is a great product to have in your car, especially if you have kids. It protects your car upholstery fabric from all the shoe marks and muddy feet. It is very simple and easy to install, comes with adjustable straps. It is easy to wipe and clean. Quality is no doubt very good and I would highly recommend to have one for a great price under a tenner. Excellent idea and expensive looking. No more dirty marks on the seats from kids in the back ! Great product, really hardly, brilliant for toddlers who like to kick your seat with dirty wellies! Good product to protect back of seats from tiny dirty feet. These are fabulous to put on the seat in front where my toddler sits in the car. I have a Nissan Qashqai. It fits perfectly. My mum has a Volvo D40 and it’s perfect in hers too.Good quality and reasonably priced. Fast delivery. Package arrived within a few daysLooks lovely and does the job ! Easy to fit to our Skoda seats. Fully adjustable so I imagine it must fit most cars. The material and stitching is good for the price and they seem to wear well. They cover most of the back of the seat so my kids in booster seat and toddler seat can’t kick outside the mat so the seat backs are clean! I like that it is mostly black with a little pattern stitched on so is quite subtle. Easily fitted and should give the back of my seat protection from the wayward feet of my grand daughter. I didn’t have to use the strap around the seat as clipping the two hooked bottom straps under the seat has held them in position really well. I currently have a Peugeot Partnr Tepee but I will be changing to a Seat Alhambra soon and I will update this review to advise how they fit my new car. I have one of these on the back seat of a Focus for a rear facing seat, and one on the back of the passenger seat for a forward facing seat. It works well in both locations, looks smart and seems well made. They were easy to fit and fitted flush to the seats. Excellent service. Easy to install, size just right and appears to be durable. Very good and easy to fit. Only critism is that the pockets are not elasticated which basicly means you cant put anything in them, we didn’t buy it for the pockets so only a minor crirism. Look nice and fit the seats fine in my VW Touran. THe only negative is that the bottom connected goes all the way around the seat and stands out. Could they come up with a smarter way to attach? Works perfectly in our cars. Easy to fit and works really well. We fitted one on a Honda CRV and one on a Hyundai i10 – equally good in both. Very easy to fit and protect the back of the seats. At the weekends, my car gets very very messy as I am constantly out and about in the outdoors so my interior does suffer from muddy foot prints and scuff marks.Not only this, my nephew is growing fast and is not far away from the seat kicking stage so I want to be prepared for this!Lots of reviews of similar product always focused on the small size and poor quality material which had always put me off purchasing a set online. Thankfully, I had no need to worry with these eat protectors.They come in a 2 pack which is great to cover both chairs, they feature a subtle yet fun design in the corner, They look great and fit well with elasticated holder at the top and bottom.The black colour does show marks very quickly as expected but this is easy to rectify with a quick wash (cool and with similar colours)With a money bak guarantee, you cant go wrong so I would highly recommend!Please note, I received this product at a discounted price in exchange for n honest review. Easy to fit, good quality, good value. 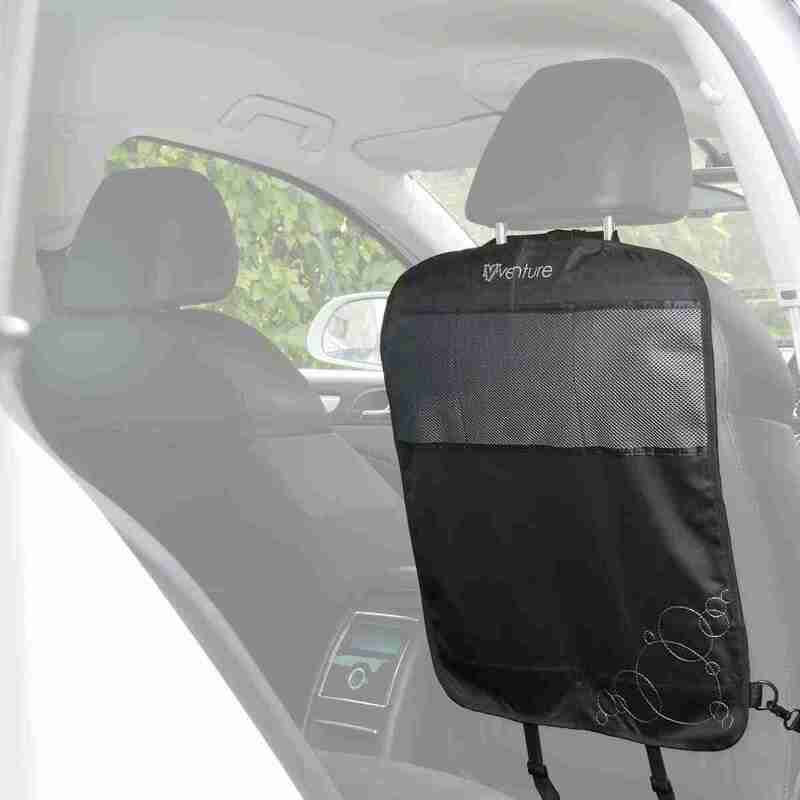 Great product for protecting the back of the driver/passenger seats – especially with a light coloured interior.Easy to fit and remove when needed. The very best car seat protector kick mats out there….recommended to all parents of children and other creatures! Brilliant product. Protects the whole of the back seats of our Zafira and a perfect snug fit. Happy days!! Fit easily. Great guards and flush on back of seat. Strong material, good quality. Would definately recommend. I have a Renault captur and they are a perfect fit. Fantastic quality and great value for money!! Fit in lovely with the decor of our car with a full protection coverage of the seats!! Excellent product for a very good price. I didn’t have to use the centre strap as the hooks at the bottom and the strap which fits under the head rest held it in perfect position. Lots of other similar products don’t seem to have the bottom hooks and rely on a strap you pass around the seat, this would have been a problem on my sports leather seats and also would have spoiled the look from the front. Fits the back of my Ford S-Max well enough. Was worried that the inside would look cheap with them but actually they are ok.Very useful to stop little one getting the seat dirty and pockets handy to put stuff. My 5 year old puts his cars and sunglasses!!!! Does what it says, keeps grandkids feet of the seats and helps keep my blood pressure down. Kid can now kick the back of the chair and it’s not going to get the seat all manky.She can store her crap in it too.They fit a 2013 Fiesta. It’s a red one. Netting ripped away. They protect the seat but the pockets on the back are easily ripped by kids. Perfect for mt car seats, it adjusts very well! Fit well in my ford focus 2012. I bought these as I recently purchased a rear facing car seat and wanted to protect the car seats from my three year old shoes. The product was delivered quickly, easy to put on the seat and give a good fit and coverage. We’ve had this now for the last few weeks and it seems to be a very good product that will last for a long time. It also doesn’t seem as obstructive as some of the other similar products. Really easy to install, no need to strap around the seat as the headrest strap and bottom hooks do all the work. My fabric Golf GTI seats are safe again! Great – fits the back of our Lexus r450 seats perfectly. Discreet straps as well which can be hidden by tucking into the seat crease. Fitted to an XC60, although ‘fitted; is being generous – due to the seat size and shape Ive had to make it work…Not the products fault as all the others use the same method of attachment.Product seems fine – not much to it is there!! Excellent quality, easy to install. Does exactly what i bought the item for. Delivered on time. Brilliant Kick Mat! Made from quality material and very easy to fit! Delivery time was fast and definitely recommended! Very pleased with this product. it fits perfectly, And looks really good, as though it came with the car. Does the job of keeping our fabric car seat backs clean from muddy shoes. Plus handy pockets for the children’s bits and bobs. great product, excellent customer service!!!! Does the job they’re meant to do. Could have added some pockets though. Bought 2 sets in the end for mine and the wife’s car – cover the seat well and best of all hide the pocket in the back seat , so great for hiding valuables when out of the car. Not good, child of 20 months was able to rip pockets of in first day . Great! They do the job and are easy to fit. Perfect. These are simple items that do what you’d expect them to do.They cover the backs of my Volvo xc60 front seats very snuggly meaning they won’t slide about and reveal bare spots.They were a little tight to put on and there is not much length in the straps but I just managed to get them in place and they are stopping muddy shoes from kicking my driver’s seat to death. Just used for first time this week. Used for granddaughter in her car seat, perfect no feet hitting the leather seat in new car and again this week to go for a short break with two dogs in back of new car. Very impressed, do what they say and well worth money. Worked perfectly for my rear facing seat and 3 year old! Very simple but effective. Very reasonable price. I have a Toyota and it is a little short for my seats. It is better than nothing though. Very easy to install, you don’t need to have uncomfortable straps across the back of the front seat, it adjust perfectly well with the hooks under the seat and the strap at round the head rest. Sturdy material, useful pockets as well. Does the job well, fits around the head-rest and the bottom of the passenger seat. The elastic around the passenger seat can’t even be noticed as it’s right at the bottom of the seat. So far it’s durable and easy to clean. Quality mats at a very good price. Much better than others that I’ve previously purchased. Really good quality back of car seat protectors. Ours get lot of hammering from little feet. This is our second lot as we got some for our second car. Bought this after my eldest kept getting footprints on the leather seats. We have a Nissan Qashqai so very happy it fits. No complaints from the partner and easy to clean too. If only it had pockets. 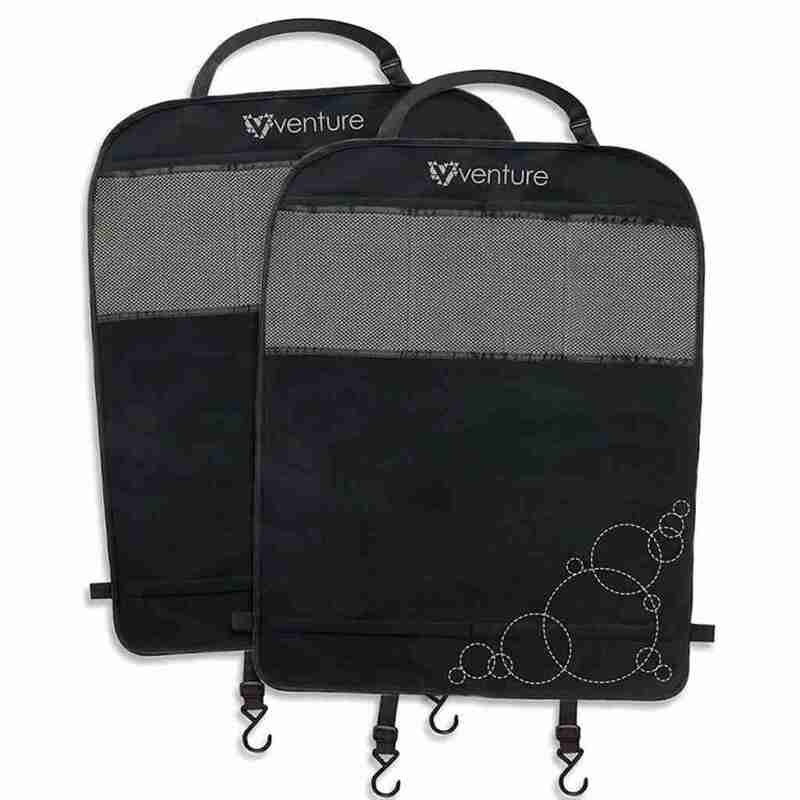 Just bought these as I needed an extra kick mat and found these to be better than the previous ones we bought and for the same price.We really like the Venture car accessories and have a few now. Good item – does what it should. 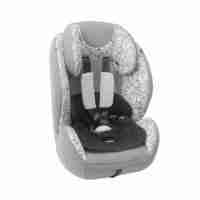 These do what they say they do – fasten around the seat and protect it from little kicking feet. Exactly does what it says!No more mud or dirt on my seats. Good fit- does the job well! 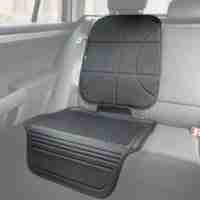 These are excellent and covered the back of my Ford Focus front seats. They look smart and are hardwearing but would easily brush down or wipe clean. They probably would go in the washing machine too. Attaches around head rest and bottom of back rest. The cover is snug and doesn’t gape or sag. Only reason I never gave it 5 stars is the bottom strap isn’t flush on my car and leaves a band at the back rest. Ideal they really do save the back of the front seats. anything that protects my seat from wandering feet. Great product for the money – under a tenner & manages not to look “cheap”. Perfect size to fit to mk7 Golf using just the top hoop and bottom hooks and very easy to fit. Received as reviewer, product does as says. Do the job nicely, stopping little feet destroying the back of my seats! Found these to be very affective when grand children are in the car,brilliant for keeping the back seats clean from dirty feet,awesome buy. Keeps the car seat clean. Tired of dirty footmarks and scuffs on your car seats? Many parents understand the frustration caused by your little ones kicking the back of your car seats. Not only is it annoying, it can also cause a lot of damage to your seats and it leaves them untidy. 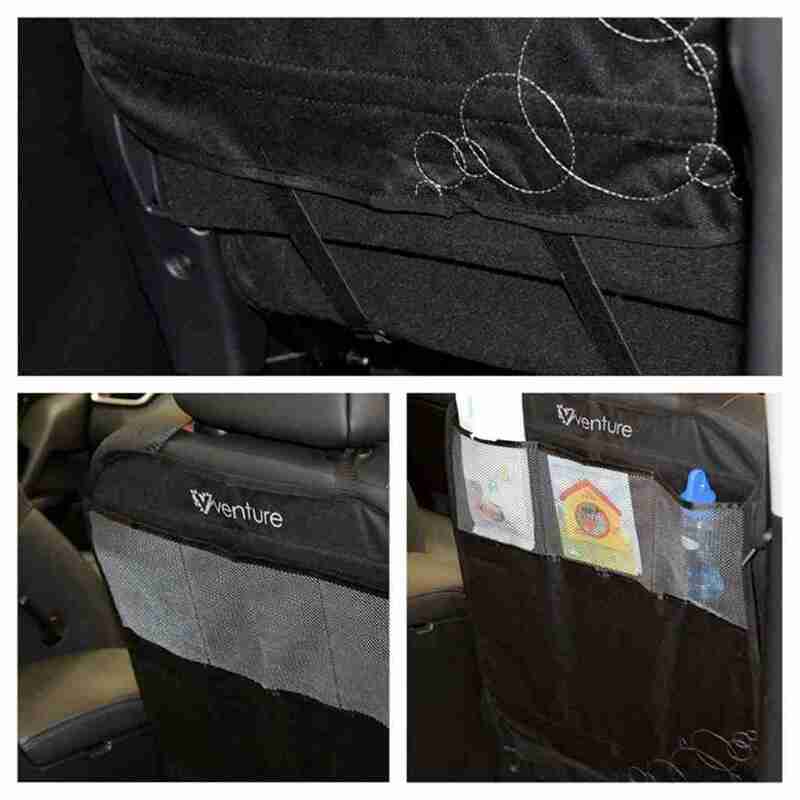 Venture Car Seat Kick Mats are designed to combat the dents, dinks, and scuffs. 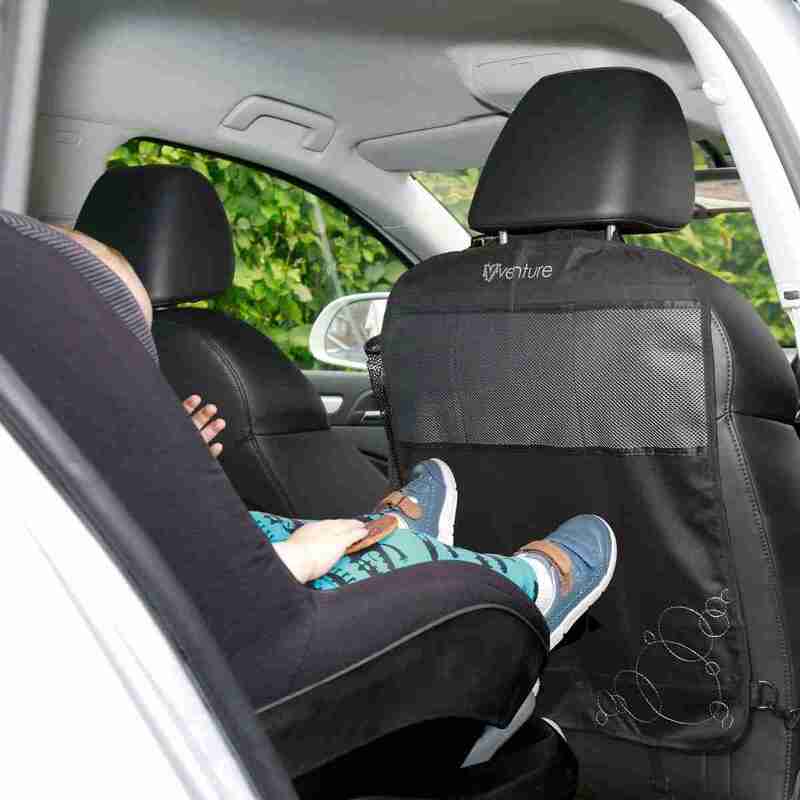 Designed with high quality fabrics Venture Kick Mats fit most car seats perfectly so you’ll never again spend hours washing out the mucky stains the kids have left, or even worse, spending a fortune at a professional car valet! In each pack of Venture Car Seat Kick Mats you’ll get two protectors that can be fitted to your seats within minutes. Simple bungie straps can be extended and hooked over the bottom and top of the seat to hold the kick mats firmly in place. And not only are the kick mats great at protecting your seats, they also have a some handy mesh pockets that can be used to store your childs favourite toys or essentials.